I am doing my happy dance over here as I type! I have been anxiously awaiting this reveal for a little over a week since completing our guest bathroom renovation for the One Room Challenge hosted by Calling It Home and House Beautiful! If you are just tuning in I will do a quick recap! In Week 1 I shared the mood board for this project. 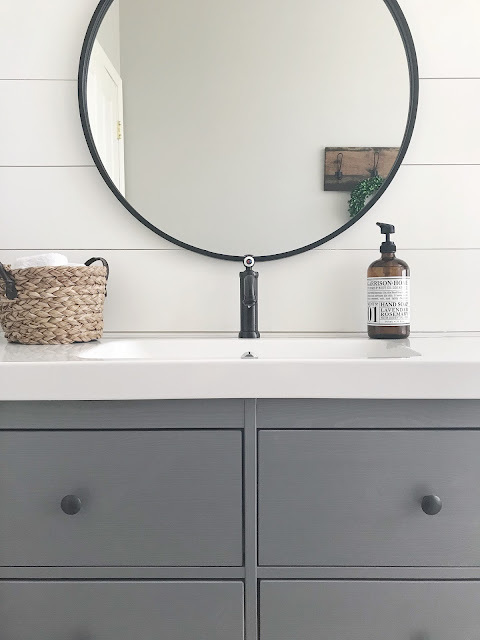 In Week 2 I shared my favorite bathroom vanities on a budget. In Week 3 I brought you a tutorial on how to install a bathroom vanity. 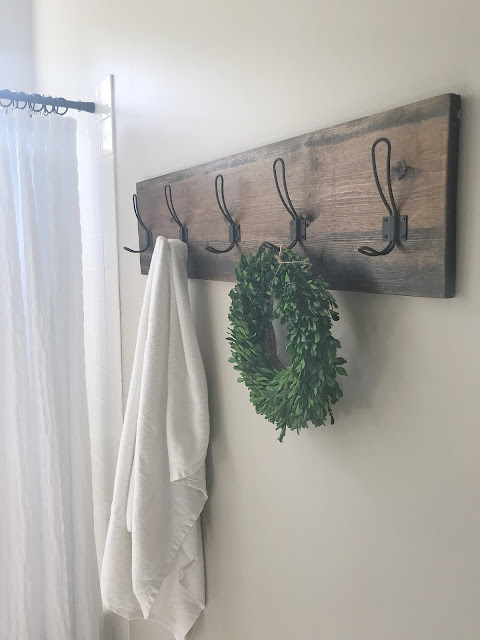 In Week 4 I shared how to make a farmhouse inspired towel rack. 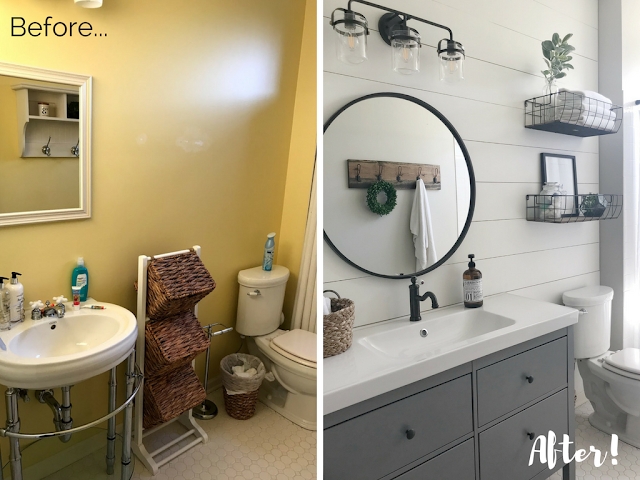 Week 5 was my favorite part of this makeover and I shared how to create a faux shiplap wall. Which brings us to Week 6, the final week of the One Room Challenge and REVEAL week! Ok, let's get to the good stuff shall we?! Here is what the bathroom looked like before. And this is what this room looks like now! 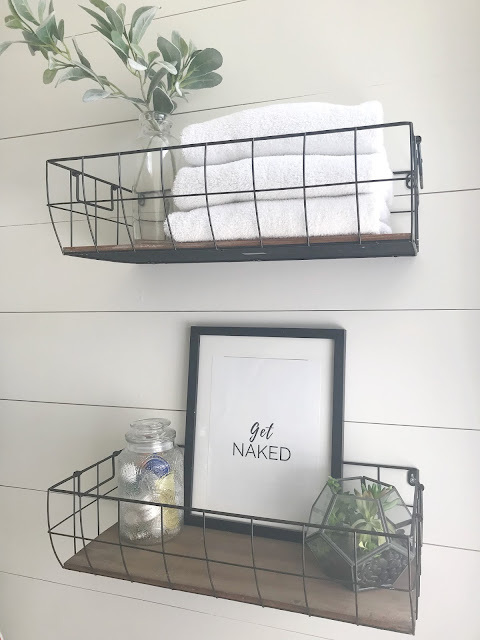 I scored these awesome wire basket shelves at Hobby Lobby for $15 a piece (on sale)! 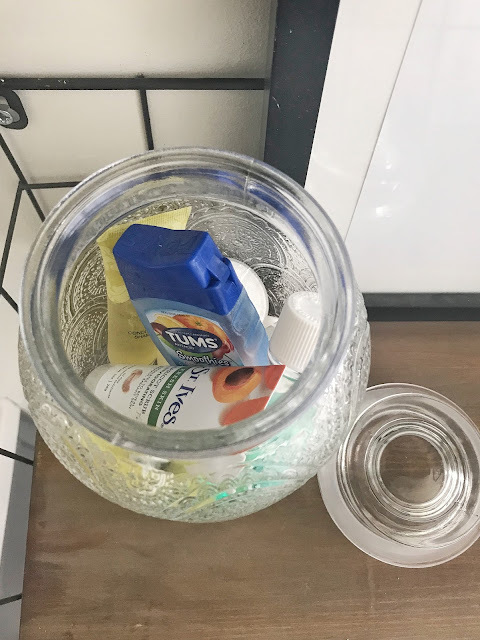 I have always wanted to have a jar of goodies for guests! 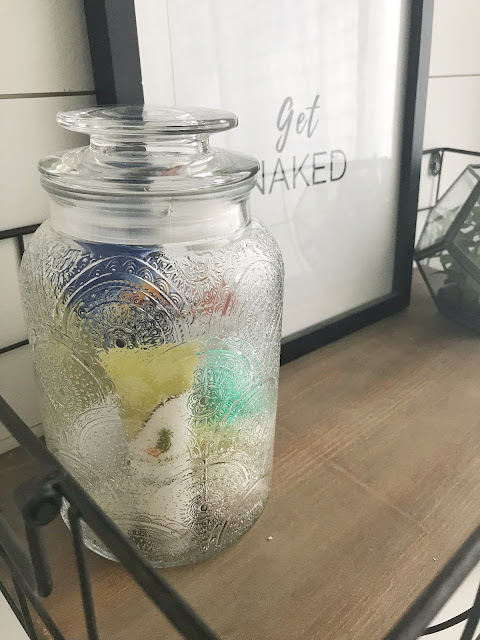 This Target dollar spot find works perfect at just so slightly hiding what's in it! 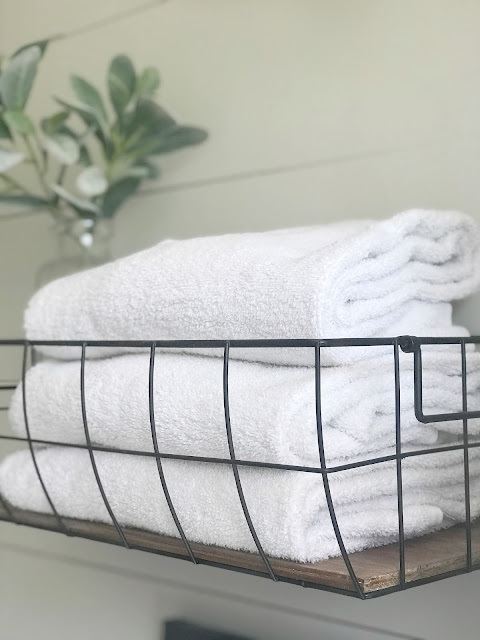 I also happen to love white towels! So easy to keep clean thanks to bleach! 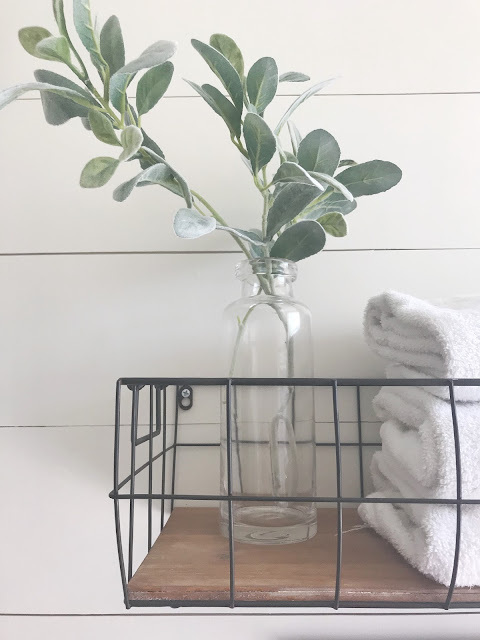 I love throwing some lamb's ear in just about any space to add some greenery! 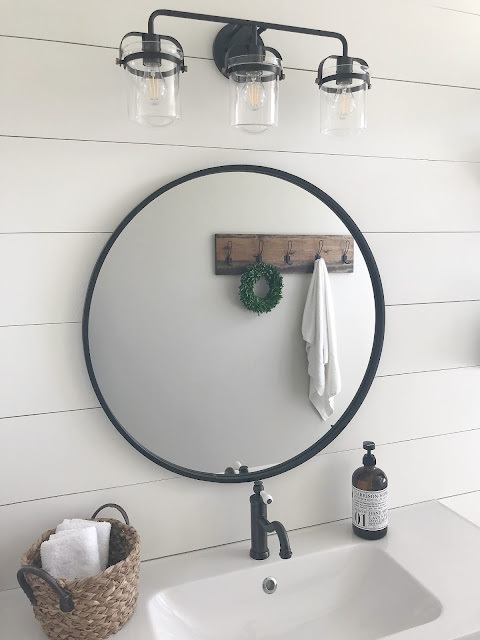 I scored this awesome mirror at Hobby Lobby for $60 but I've linked a similar one here! I found this soap at HomeGoods for less than $10 and it smells amazing! I love having a basket of hand towels available to guests to use for whatever they need (I might actually need a few more, haha)! Let's focus our attention on this amazing light fixture shall we?! How gorgeous is this piece? And these LED Edison style bulbs are the perfect touch! I love how they look on and off! 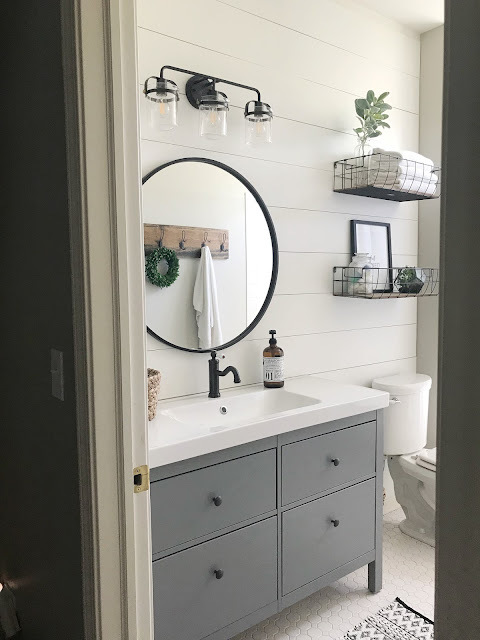 The biggest and most expensive change in this room was adding this vanity from Ikea. I absolutely LOVE this piece! 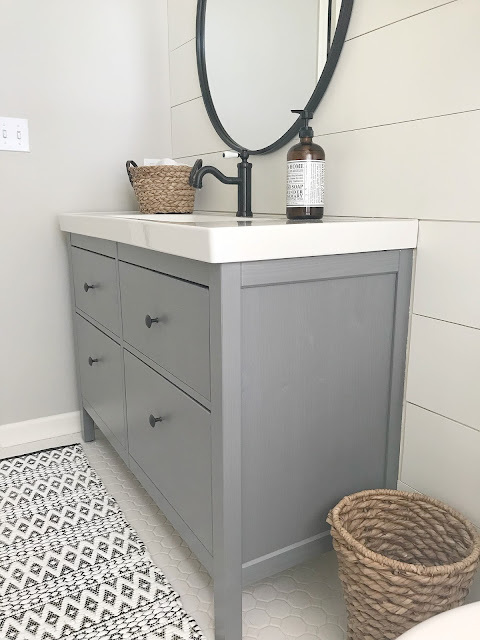 I still cannot believe that both the vanity and sink were under $500! 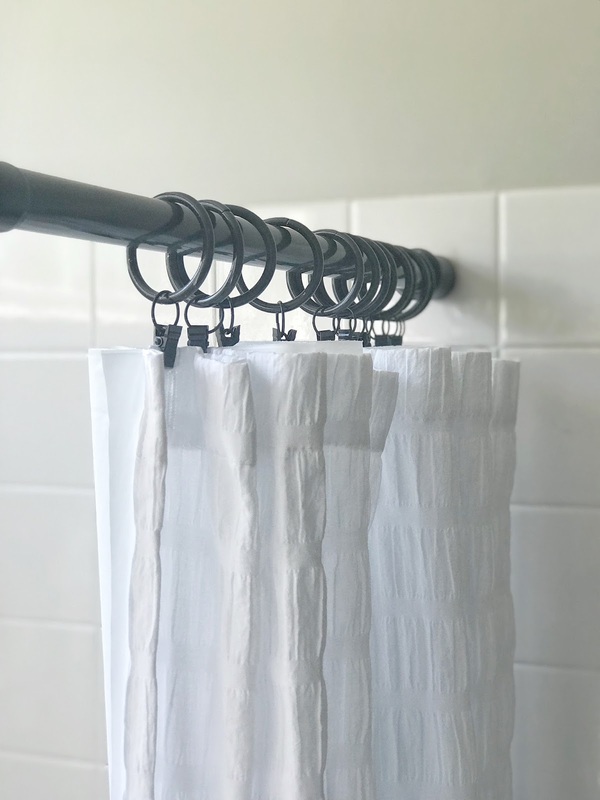 One of the least expensive but majorly impactful changes I made was swapping out our old chrome shower curtain rod for this black one. I had some old drapery rings handing around and I love the fun detail they add instead of traditional shower curtain rings! This towel rock was a labor of love! Check out the full tutorial here. 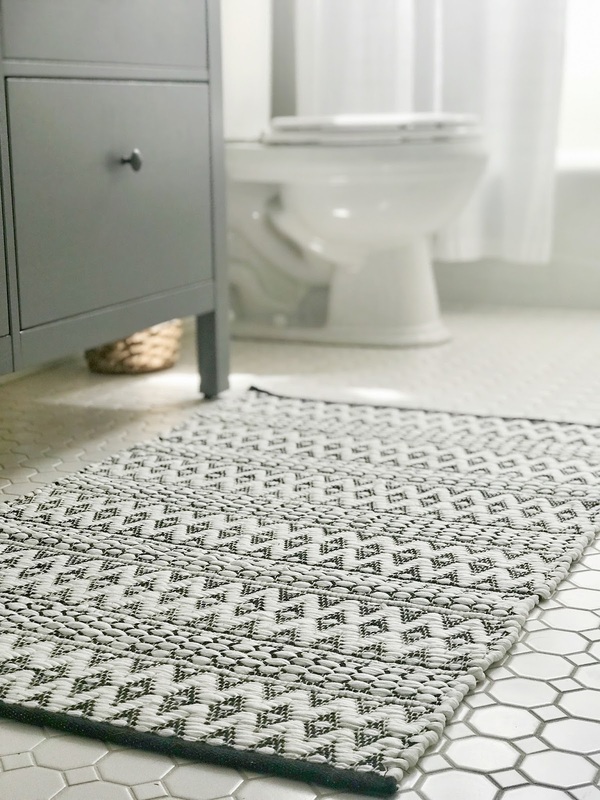 This rug was a last minute Hobby Lobby find! I thought it was the perfect size and a great way to bring in some texture! 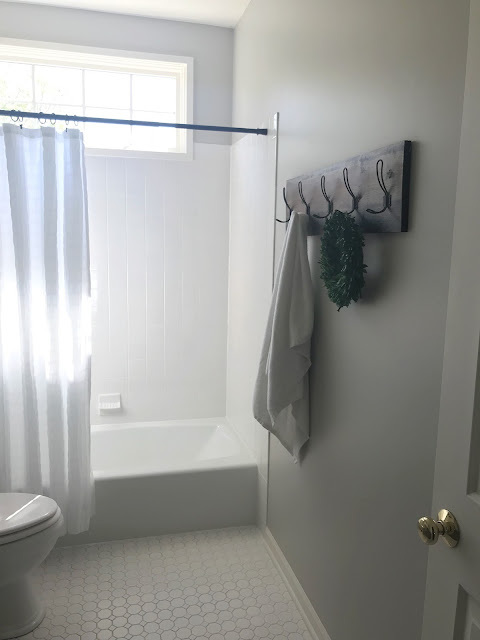 Can you even believe this was the same bathroom? I know I can't! Our nightly bath routine just got a little more fun! This was easily the best way we have ever spent our tax return! The results of this makeover are absolutely amazing to me! Here are a few before and afters! Be sure to check out all of the Featured Designers and Guest Participants in the One Room Challenge! There is going to be some major inspiration here! I am so ready to get my hands dirty again! Interested in following along for my next project? Check out my Summer Bucket List here! 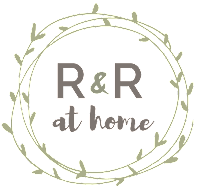 And as always, Thank you for visiting R&R at home! Love that transformation! The splashes of black are just my style. Great job!! Hi Amanda! Thank you so much! It was such a fun space to design and much more modern than my normal style- I have a feeling this style is going to creep into the rest of my space! So fabulous! I can’t believe how little you spent and how great it looks! Such a beautiful transformation! I love that vanity especially paired with that mirror - I love the way a round mirror looks in a bathroom. All of the hard work definitely shows. Hi Lindsey! Thank you so much for stopping by! I honestly cannot believe I got such a deal on this mirror! It's such a big piece and really makes the space! I totally think I need those basket shelves in my life! Love this space - so clean and fresh looking now! Great job! Hi Jodie! Aren't those the cutest?! They're from Hobby Lobby and only $15 a piece on sale! And thank you so much for stopping by the blog to check out the reveal!! 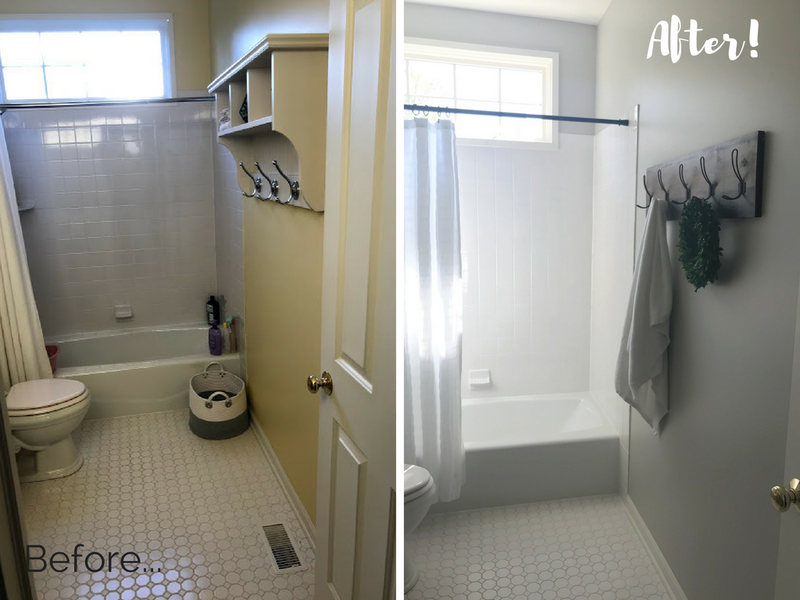 I love the transformation of this bathroom. It is so beautiful. Hi Lesa- Thank you so much! 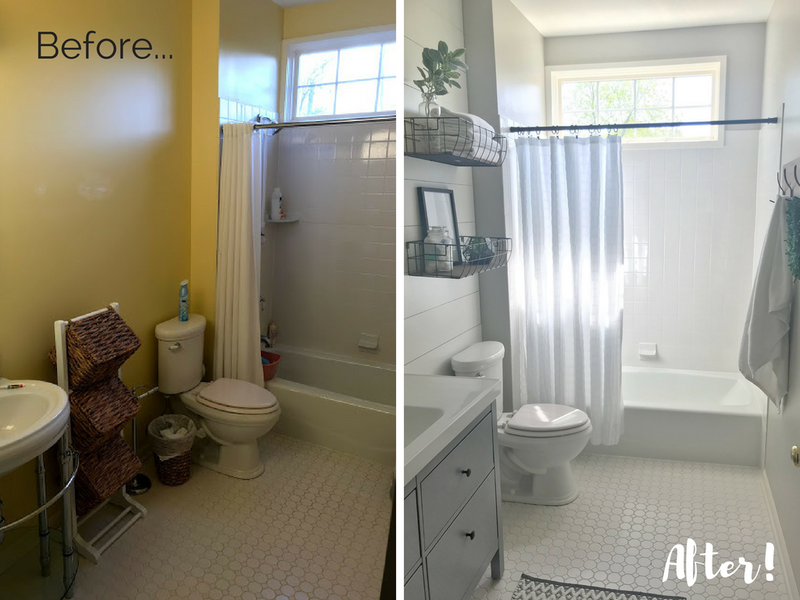 It was such a fun room to design and transform! Did you seal your shiplap? Hi Christine- I did not seal it. I only did two coats of satin paint. You can read my full tutorial on the shiplap here: http://www.randrathome.com/2018/05/one-room-challenge-week-5-diy-faux.html! But if you have any other questions let me know! Hi! Yes, It did come in grey!! Online it only shows a double sink option in this grey color but you can customize in store!! Love the bathroom!! 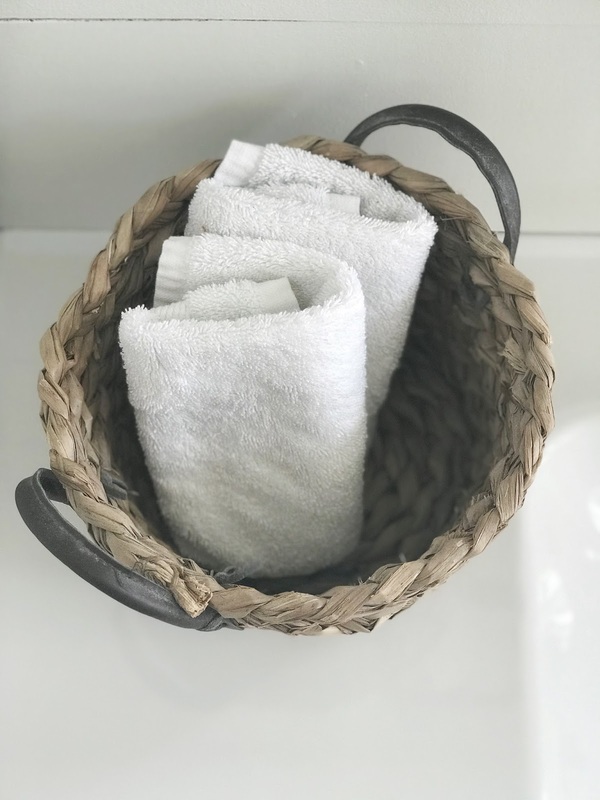 Are the baskets from Hobby Lobby the same size or two different sizes? Thanks!! Thank you so much! The baskets are the same size- the largest size! 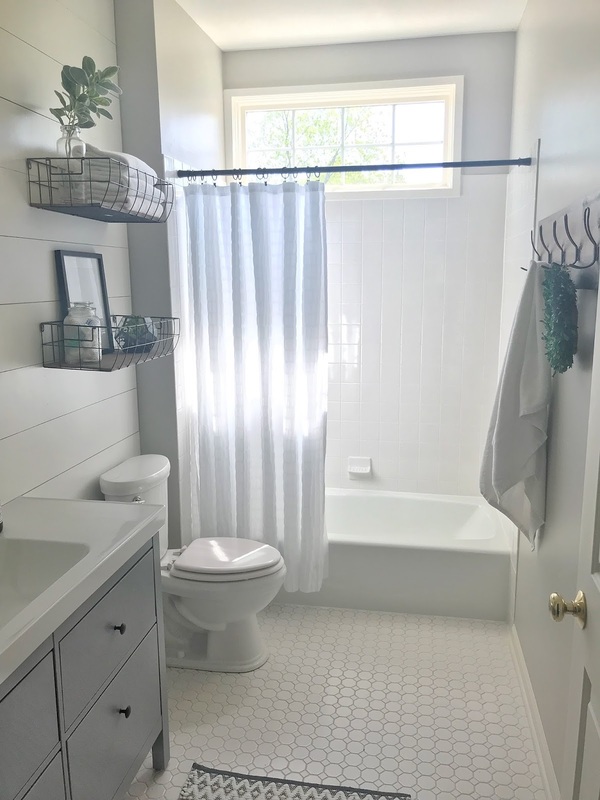 Your bathroom is absolutely gorgeous! Love love love it!! Love this so much! 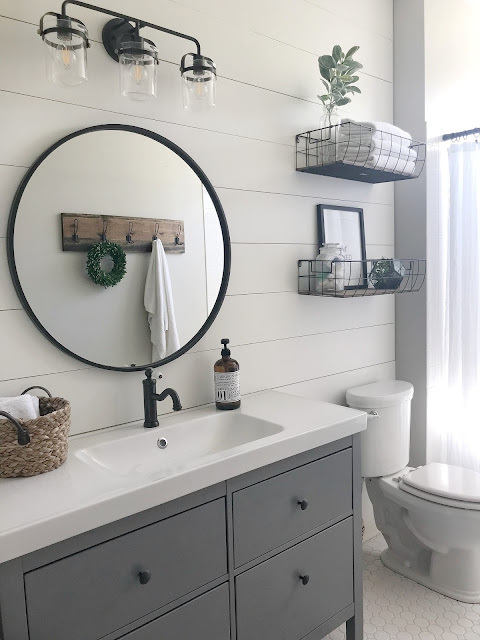 It’s currently my inspiration photo for our upcoming master bath Reno! Did you paint the vanity Grey or did it come like that? When I clicked the link to ikea it was only offered in white or black\espresso :( thanks in advance for your help! Hi! Thank you so much for stopping by- so sorry for the delay in my response! The vanity actually came in this color from Ikea! I'm getting renovate our bathroom and am loving everything about your make-over! Now that you've had your cabinet for a few months, are you happy with the quality? Also, do you HAVE to use an Ikea faucet with it? Or will any standard major brand fit fine? Hi Bobbi- Thank you so much! 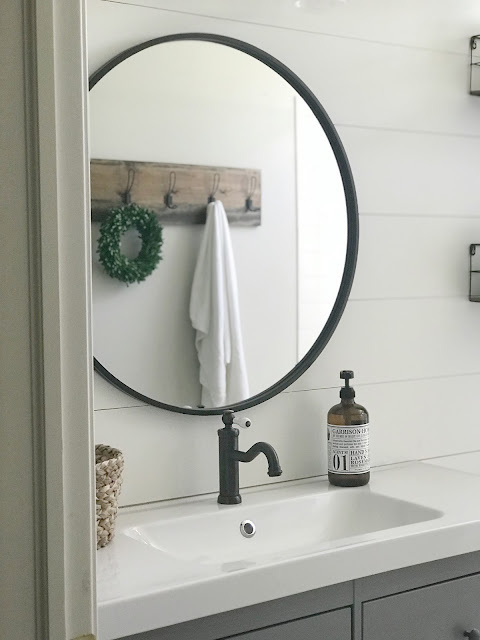 I am so so happy with this sink and faucet! 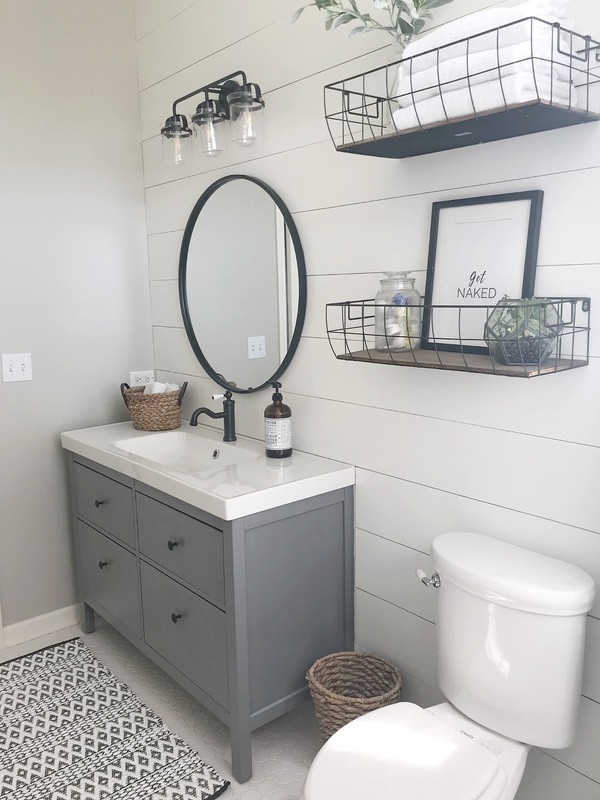 I will say that it's not a main faucet that we use since it's in our guest bath/kid's bath but I just love the deep drawers etc. I am not sure about the top- Ikea has some interesting plumbing so I do believe you would need to use their sink but they have many options! 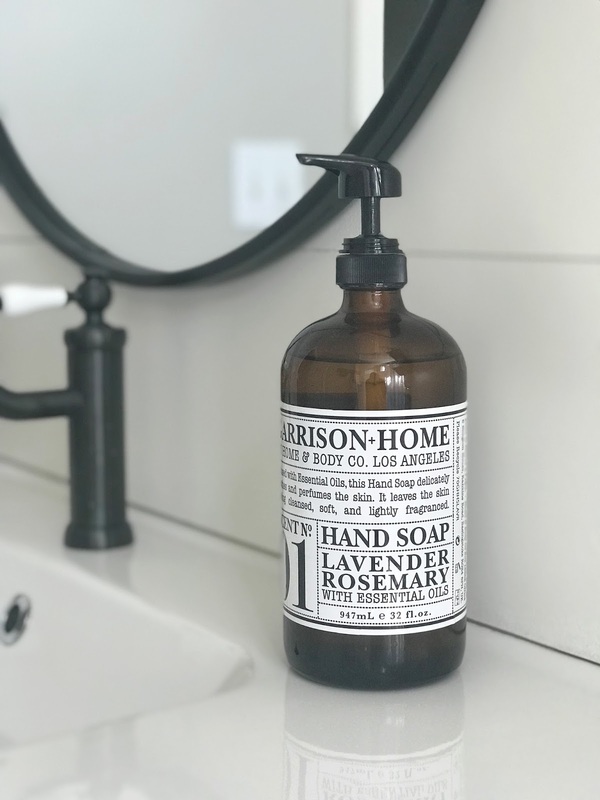 Do the Edison bulbs give off enough light in your bathroom? 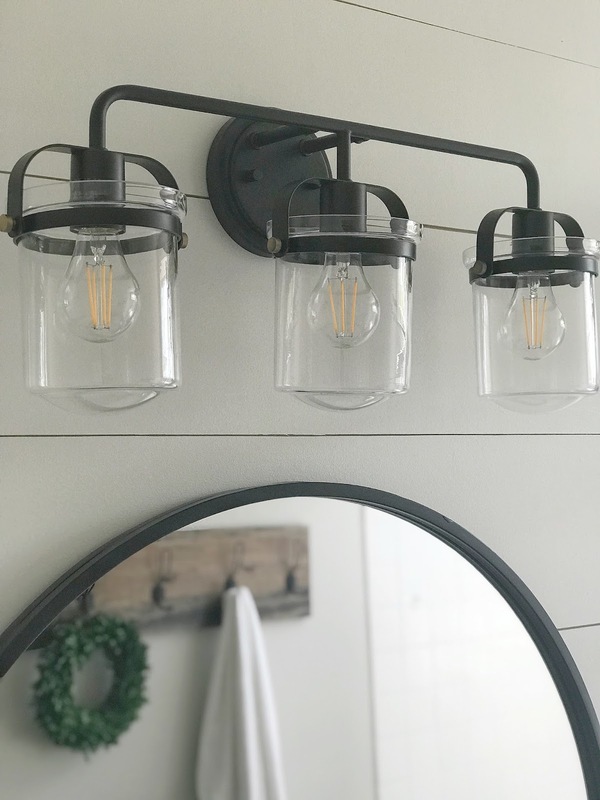 I am thinking about buying the light fixture from Wayfair but wasn't sure they would give off enough light. Thanks! Hi Anne! Oh yes, they give off a TON of light! The ones I chose that you see are really more like normal light bulbs but are more 'decorative' when off!